It is going to be such a gorgeous little fun quilt with 9 X 6 1/2" stitched blocks. This is the sweet little wheelbarrow block. If you haven't started yet it's not too late - The other 3 blocks are over in my craftsy shop for just $2.00 each. Head on over there now and Download April's block for FREE. Leave a message if you are stitching it with me so I can pop by your blog and check on your progress. Thank you Fee this is another very pretty little block! I have been keeping up and have shared the first three blocks on my blog at different times. After I complete this one I will share the first four together and let you know. Thanks for the designs. This is so cute, this is the first time I have seen this QAL, I am off to check out the first 3 months. 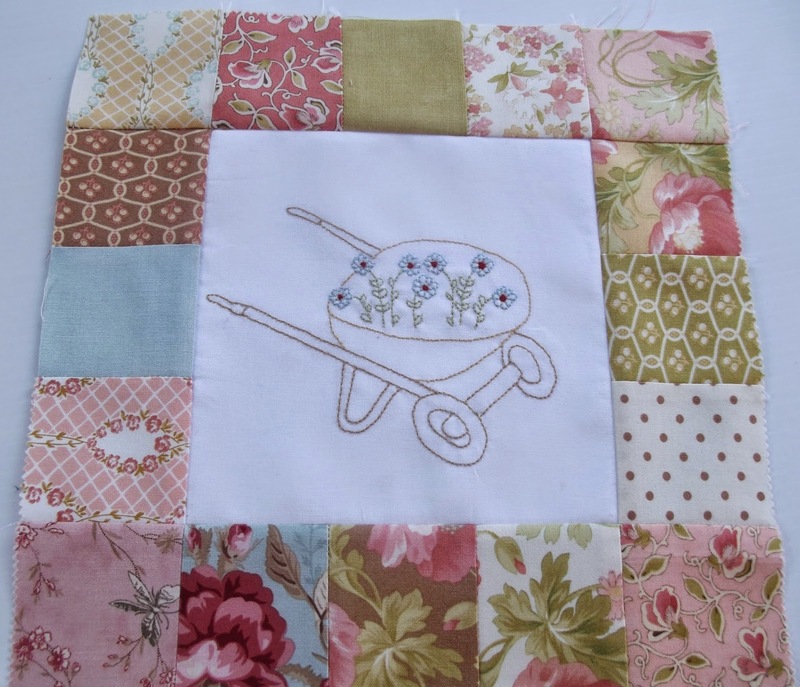 I have downloaded your free pattern for 'Up the Garden Path' every month and NOW I have started stitching. I am on Holiday in Spain and have collected the stitcheries for this opportunity. Thank you so much for your free pattern. They are so lovely and I enjoy stitching them.